Screen capture of Tesla's 'charging snake' prototype video from Tesla Motors Twitter. The charging unit automatically coils down and levels with the vehicle's charging port. It then plugs itself in, no need for hand-to-charging-port guidance. The charging robot works with the Model S and the upcoming Model X and Model 3. 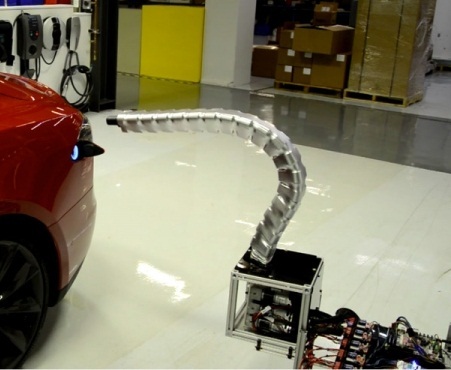 The 'charging snake' is being developed in order to enhance owner experience and facilitate the charging process. Musk first teased the development of such technology in December, via Twitter. To see the video of the prototype in action, visit the Tesla Motors Twitter.